The holiday season can be busy and stressful, but it can also be filled with joy and gratitude. Here are a few tips to keep in mind to have a positive and healthy holiday season. Just because it’s the holidays, doesn’t mean you have to overindulge. The parties and dinners are food-focused but you can keep on program with your meal regimen by setting structure and planning. Being prepared by having a plan for each event, such as how much you want to have to drink and eat. Keeping consistent to your usual routine, if you would only eat dinner, just eat the meal and bypass the need to graze the snacks and appetizers first. The more you mirror your regular food regimen, the more you keep the mindset as this meal is just one meal. In addition, create a list of traditional must-haves, such as certain cookies that Grandma only makes for the holidays. Allowing yourself to have one will ease the tension from feeling the guilt if you would have overindulged. This will provide the sense of satisfying your craving for the holiday treat and noting it’s sentimental value that will continue each year. Rushing from event to holiday party to family gathering can bring on stress and, at times, negative talk. Look at changing your vocabulary, such as taking out the words of “should,” or “must,” or “I have to.” Altering with more positive words such as “I get to” see certain relatives I usually do not see, “I choose to” spend time with my family, “I want to” make my friend’s party. Additionally, having a mantra or pep-talk as you enter an event or a relatives’ home to create a sense of calm and help reiterate your plan for the event and staying hopeful that everything goes well. 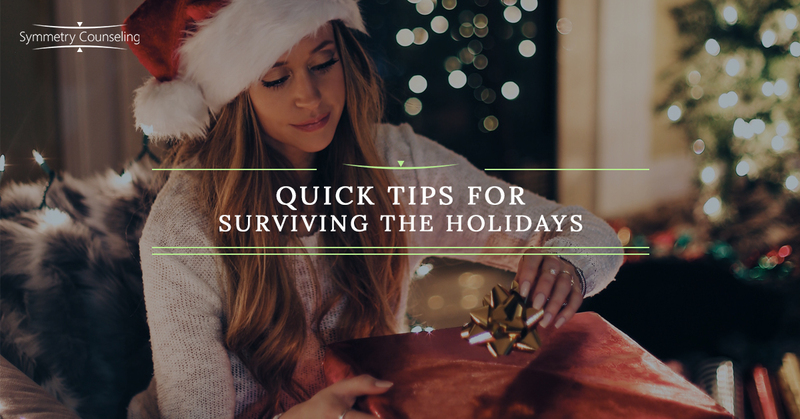 Keeping with your regular coping skills and self-care is essential for getting through the holidays, but also look at those traditional holiday aspects as additional coping skills to have in your tool box, such as decorating a tree, going to church, reflecting on past holidays, ice skating, caroling, etc. This can provide a way to look at those as positive aspects of the holidays versus just a to-do list. Use your resilience—you have made it through the holidays before, why should it be any different this time? Knowing what will typically be served can provide a clear path for planning before heading to an event. Note your successes, such eating on plan, only having one cookie, finding the joy of the event, and reaching out to relatives and friends you have not seen in a while. Finally, be kind, sure to others, but also to yourself. There is nothing wrong with creating new traditions that may aide in your health and wellness. Need therapy in Chicago before the holidays? Contact Symmetry Counseling.